First ProtonMail and now ProtonVPN. Is all the hype real? No one should question how much of an impact ProtonMail made on the whole privacy email industry. ProtonMail came out of nowhere and allowed users to make use of its services in 2014. Needless to say, ProtonMail became an instant hit. After all, it had a development team that consisted of research students from institutions such as Harvard and MIT. Moreover, Andy Yen, a CERN researcher, and a Harvard Ph.D. candidate himself, headed the ProtonMail project. Researchers from both institutions showed that offering a high level of security along with privacy within a web email service fell into the realm of possibility. Moreover, they achieved that by offering an easy to use and convenient email service in the form of ProtonMail. ProtonMail worked just like Gmail, only that it had more privacy and security. Now the company behind ProtonMail, Proton Technologies AG, based in Switzerland, has come up with its own Virtual Private Network service. How is it different from the rest of the pack? Well first off, ProtonVPN has a huge advantage over the rest of the field from the fact that it comes from the creators of ProtonMail. In short, ProtonMail has a great reputation within the community. And ProtonVPN will no doubt leverage that. But that fact can also play the other way. In other words, people are expecting great things from ProtonVPN. 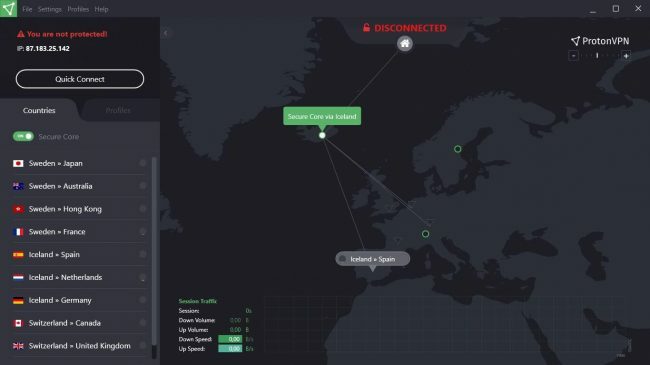 Will ProtonVPN handle the pressure well and still deliver? Read this ProtonVPN review to find out if it matches the high standards of its sibling service Protonmail. 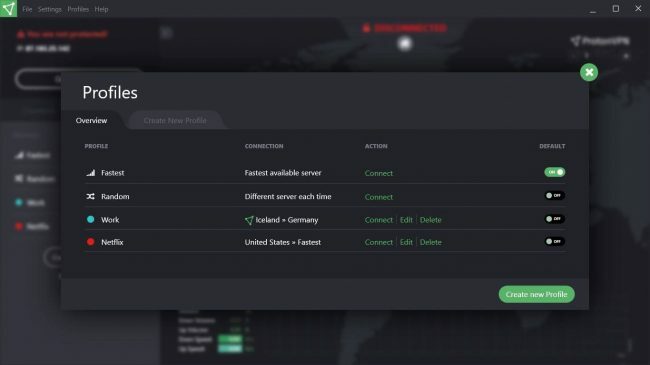 ProtonVPN comes with four VPN packages. All of these packages are separate. So it’s not like they are the same packages with different pricing based on their subscription duration. You can use ProtonVPN for free. And then it moves up to as much as $30 each month. That is if you want to pay on a monthly basis. If you would like to subscribe to ProtonVPN on an annual basis then the company gives you a 20% discount. Current ProtonMail users have it good as well. If ProtonMail users have the premium paid-for email accounts with ProtonMail, they have the option to claim an official 20% discount. This discount is cumulative in nature. In other words, it will add up to the annual subscription charges discount. As mentioned before, there are four subscription plans. For online users who don’t want to sign up for a free VPN and actually want to shell out some money, we think that the ProtonVPN Plus subscription plan is the best one. It hits the sweet spot, as they say. The ProtonVPN Plus plan offers access to all of the company’s VPN servers. And it does that at the highest possible speeds. Moreover, this plan also comes with access to each of ProtonVPN service’s advanced features. What About The Visionary Plan? That is not really for the average user. In fact, even for users such as those of ProtonMail, the Visionary plan is a bit too much. If you are buying a VPN service for your business then perhaps the Visionary plan would make sense. That doesn’t mean individuals can’t use it though. People who want to support the company with all Proton projects can sign up for the Visionary plan. And users who want to go beyond a typical VPN service can sign up for the Visionary plan as well. For the purposes of this ProtonVPN review, we will focus on the ProtonVPN Plus subscription plan. We have researched the speed statistics of the free plan as well and we’ll talk more about that in upcoming sections. ProtonVPN provides one of the longest money-back guarantee periods that we have seen from a VPN service provider. Currently, it stands at 60 days. You can use ProtonVPN for 60 days and if you’re not satisfied, you can get your money back. Of course, there is always the option of using the free ProtonVPN service for as long as you want. After you are satisfied with the free service, you can upgrade to their other paid subscription packages. ProtonVPN doesn’t advertise any opportunities for a free trial on its official website. But once you download the company’s Windows software application while using the free plan, the company will grant you a seven-day free trial of its ProtonVPN Plus subscription plan. Readers should know that the free trial is not available to everyone. In other words, if you are using the company’s custom VPN client, only then can you apply for the free trial. You can’t just download ProtonVPN Plus plan’s configuration files for its OpenVPN server for the duration of the free trial period. It means they can, at the time of writing this ProtonVPN review, only use the free trial option if they are on the Windows platform. ProtonVPN doesn’t have a payment processor of its own. It uses third-party payment systems. In other words, whatever information it requires from the user to sign up, it doesn’t keep it for itself. Users can also pay via Bitcoin. Because it provides the maximum amount of privacy. You can also donate using Bitcoin. Free users can do so by hitting the Donate button with Bitcoin to Proton Technologies. The company and third-party payment services will credit that donation to the user’s account. As mentioned before, you can use Bitcoin to purchase ProtonVPN subscription packages. You can also use Bitcoins to upgrade. Moreover, these Bitcoins also work if you want to buy ProtonMail services. You will have to contact their support staff for more information on that. Bitcoin is great for privacy. In other words, it is a completely anonymous payment method. The company also accepts anonymous cash payments. If you know how to mix Bitcoins properly then that is great as well. But all of that should not lead you to believe that ProtonVPN would always have a record of your original and real IP address. It doesn’t matter how anonymously you try to pay the company for its VPN services. 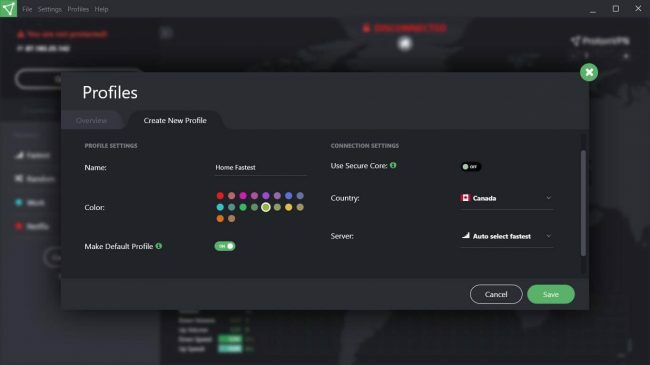 Now, ProtonVPN Plus plan has some key features. As mentioned at the top, the features of each of these plans vary with the plan themselves. Ability to engage in peer-to-peer or P2P file transfers. Most of the servers are situated in North America and Europe. But ProtonVPN also has VPN servers in Australia and East Asia. It is a feature that has the main objective of protecting online users against online traffic correlation cyber attacks. ProtonVPN representatives would tell you that this feature is unique. But in reality, it isn’t. This feature is basically a rebranded version of the Double-hop feature. You can find VPN service providers like NordVPN offering similar features that work on similar principles. Tor also offers such features if that makes ProtonVPN claims sound a bit over the top. But what is this traffic correlation attack? Well, hackers carry out such attacks by monitoring online internet traffic. They know that all internet traffic first has to enter a VPN server and then it has to exit it. Using that information, hackers can just sit and monitor network traffic. Additionally, hackers can identify patterns. If a given user usually connects to a VPN service’s VPN server at about the same given time, time and time again as that of another user that uses the same VPN service to visit a website that hackers are monitoring, then hackers can easily identify the individual who is using the VPN service to visit a specific website. A lot of internet users are paranoid about what hackers can and can’t do on the internet. These types of attacks don’t occur often. In fact, hackers don’t just go ahead and target anyone. These are special kind of attacks. Attacks that hackers carry out only against high value target. In other words, you must be an important person. Not only that, another important person must be interested in what you are doing on the internet. Only then can hackers come into the picture and do the dirty work for that person who is interested in your activities. Regardless, ProtonVPN has Secure Core to help against such threats. Well, it first routes the user’s VPN connection via the company’s Secure Core VPN server. This action makes it impossible for hackers to perform any kind of traffic analysis on the company’s second or exit server. Theoretically speaking, hackers could still perform traffic analysis on the network via the initial ProtonVPN Secure Core server. But, as mentioned before, ProtonVPN is a good VPN service provider. In other words, the company has taken measures against that. Well, let’s just say that they have taken measures that make it very difficult for hackers to carry out their attacks. More specifically though, Secure Core servers aren’t ordinary servers. They are usually located in regions and countries where privacy laws are very strict and strong. SEcure Core servers are different from normal VPN servers in the sense that ProtonVPN itself owns these servers. The company operates these servers itself as well. In other words, most of these secure core servers are under the careful watch of the company. ProtonVPN protects these type of servers with an elite level of physical security. According to official sources, Secure Core servers are actually different from normal VPN servers in the sense that they connected to the internet via the company’s very own dedicated network. This dedicated network has its own IP addresses. And ProtonVPN owns and operates these IP addresses and networks via their own LIR or Local Internet Registry. ProtonVPN also takes this opportunity to point out that users should not expect anything to provide 100% privacy and security. With that said, we are confident that this ProtonVPN setup would provide users with a very secure VPN setup. This is another advanced feature. It allows users to make use of ProtonVPN with another anonymity service called Tor. This whole setup is called Tor via VPN. But users have to set Tor via VPN configuration first before using this measure. It is one of the most useful features that a VPN service provider could offer. Because not only does this feature give you everything a VPN service could, but it also gives you the best features of Tor. This feature basically connects you to Tor hidden services. With this feature, you can do all of the above with your regular web browser. Moreover, this feature also ensures that the user’s whole internet connection can benefit from Tor via VPN protections. We have discussed this before as well that even though Tor via VPN looks great on paper. And probably works fine as well. But the better option is to just use the Tor browser and then use a VPN service. The setup we have just described is safer. And of course, it is simpler to use. So just download and install the Tor browser. And then connect to VPN service. ProtonVPN is different from other VPN service providers in the sense that it runs its own VPN servers as well as Tor servers. Therefore, ProtonVPN removes the possibility of malicious Tor exit nodes. These won’t cause you any problems if you are using Tor with ProtonVPN. Nothing compares to the Tor browser. It is a hardened browser. Your regular web browser is not. The Tor browser is also great because it resets the user’s Tor routing after the passing of every ten minutes. This is the setting by default but you can change it if you want to. Well, it only requires a static route. Hackers find this static route inherently easier to track and trace. There is one other interesting point that we have to discuss here. 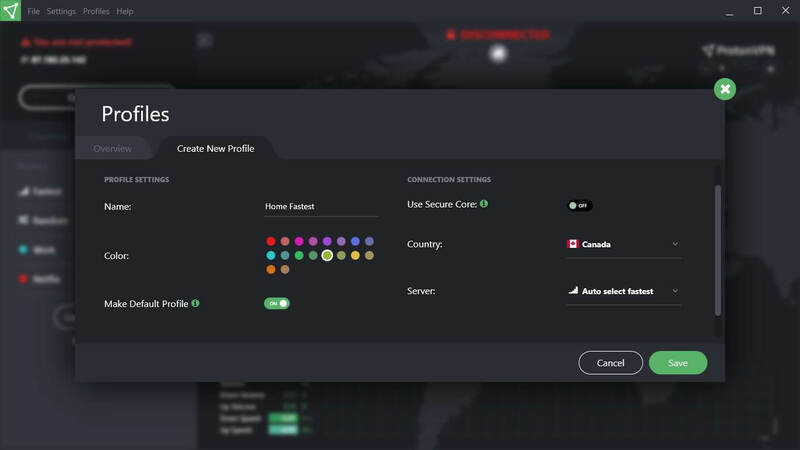 ProtonVPN advertises this feature on its site. It also offers this feature via its software application. But surprisingly the service does not have any documentation on Tor via VPN feature on its official website. 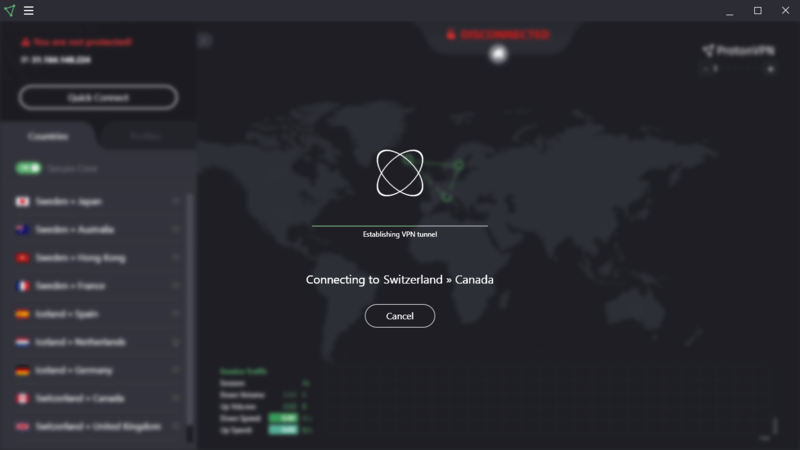 We have already mentioned the fact that ProtonVPN has its HQ in Switzerland. 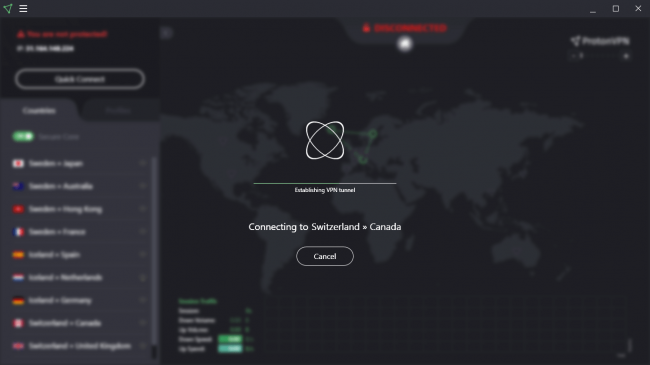 You might think that Switzerland is a bad place for a VPN service provider. And it is true that Switzerland has notoriously strong data privacy laws. But what you may not know is that Switzerland doesn’t have to subject itself to EU laws or legislation. Switzerland also does not have Five Eyes membership. It is not a member of Fourteen Eyes either. Both of these are spying alliances. And the US acts as the head of both alliances. Now, we will admit that Switzerland is a bit of weird country when it comes to privacy. On the one hand, it isn’t a member of super spy alliances. On the other, the country has passed a number of alarmingly privacy-invading surveillance laws. They basically force ISPs, internet service providers along with telecommunication operators to actually store connection logs with detailed metadata for a period of 12 months. But here is another twist. The law themselves don’t make it clear whether their wording means that they apply to VPN services and email services as well. But we can’t be too complacent here. Logging requirements are a huge problem for any company that aims to provide users with privacy and anonymity on the internet. Proton did make a statement on the issue this year. The company said they appreciated the fact that the Swiss government had recognized the important and leading role Proton Technologies AG had played in developing and disseminating the cybersecurity tools and services of the future. Moreover, the company said, they had also played a role in the economic reorientation of Geneva. Proton then mentioned that the company also had a part to play in Switzerland as a whole to move the country to the high tech sector. The company also mentioned that the Swiss government had sought an official meeting with the company in order to discuss how to ensure privacy and security in the new digital age. ProtonMail then mentioned that as a participant in such discussions, they could confirm in no uncertain terms that if implemented, the official provisions related to data retention that the BUPF had introduced would exempt companies like ProtonVPN and ProtonMail. Because both of these are not really big telecommunication companies and/or operators. All of that sounds comforting. And we are sure that may well be the case. But such situations do mean that you will have to take Proton’s words on it. The company made the promise. But it did so behind closed doors. Hence no one really knows the practical implementations of the newly passed laws. As mentioned before, the law intentionally or unintentionally uses vague terms. Unlike some other top VPN service providers, ProtonVPN does go through the trouble of publishing a transparency report. It also operates an official warrant canary. We all know how nice a transparency report looks. But transparency reports still require the user to trust that Proton would report any and all incidences. Our research shows that we should all show some skepticism. Because warrant canaries aren’t that useful if you really think about it. But some people really find warrant canaries reassuring. Along with ProtonVPN, ProtonMail also publishes its own transparency report. That document says that Proton, as a company, had previously complied with several data requests. The more worrying part is that these requests didn’t even come with valid court orders. But our research shows that both cases represented circumstances which justified the company’s decision to comply. Our research also tells us that even though ProtonMail compiled, it supplied little information to authorities in any case. Besides, we shouldn’t nitpick Proton that much. Because when all is said and done, the user has to make a decision about whether he or she trusts the VPN service provider or not. That is how VPN services work. As mentioned earlier, ProtonMail has a superb reputation. And the company has worked hard to establish that reputation. Hence users have all the reasons in the world to trust ProtonVPN as well. And we hope that ProtonVPN remains true to the company’s privacy claims. As far as protocols go, ProtonVPN only offers one type of protocol. And that is the industry-standard OpenVPN. While that is great for security, it isn’t such a great news for certain users. Certain users like the ones who use legacy or more obscure hardware. Because they may not have the capacity to use OpenVPN. Regardless, we commend ProtonVPN for sticking with OpenVPN. If a VPN service provider can implement the OpenVPN protocol properly then it is the only and only VPN protocol that is truly secure. Well, as far as the OpenVPN data channel goes, ProtonVPN makes use of AES 256-bit cipher. With that, it uses the RSA 2048-bit handshake encryption. It also makes use of HMAC SHA-1 for hash authentication. ProtonVPN provides perfect forward secrecy via Diffie Hellman key exchange. Needless to say, ProtonVPN has a pretty secure VPN setup. Users who want more security can make use of more powerful control channel ciphers because ProtonVPN does have options for that. If you want to know more about the encryption technologies that ProtonVPN uses then head over to its official website. We did not find it surprising that ProtonVPN official website used the same template for its design as the official ProtonMail website. In other words, both look professional. And the developers behind the site have taken good care of aesthetics. Generally speaking, users will find the website useful at providing them with the information they need to know. The official website does a great job of explaining concepts. And it presents the information in an easy to understand format as well. The company also has an official blog. The blog mainly functions as an outlet for company announcements. It also has content on press releases. Moreover, you can also find news articles related to the VPN service that is ProtonVPN. For any VPN service provider, the first place to get support is via the FAQ section. The FAQ is also very well presented. That doesn’t mean it is extensive. But it does a decent job of delivering answers to many common user questions. It also addresses some of the most common issues people face when setting up a VPN service. There is always a chance that the FAQ section won’t have the answers you are looking for. For those moments, ProtonVPN has email support for you. Our research for this ProtonVPN review shows that their customer support team can take as few as four hours to respond to your queries. If you ask difficult questions though they may take longer. Like a day or more. And expect vague answers to difficult questions. But they will provide you with useful links though if they can’t comprehensively answer your questions. First, you need to sign up for ProtonVPN. One of the ways is via a free account. For that, you must give ProtonVPN a username and your email address. Give them your valid email address otherwise you won’t get through the registration process. Of course, you don’t have to give them your primary email address. No one is going to stop you if you use a disposable email address. But make sure that the email address you use has the capability of verifying confirmation emails. ProtonVPN gives users the option of verifying their account either via email or via an SMS message. You can also make a donation to the company to verify your email address. To verify via SMS, you will have to give ProtonVPN your phone number. That might present a problem for some users. ProtonVPN says that they do not permanently save their customer’s email address or phone number. In other words, they delete such information after the user has verified his/her account. For users who want to sign up in a more anonymous way, there is Bitcoin. Users can make use of Bitcoin to donate and buy subscriptions. For users who already have a ProtonMail account, they can just go ahead and join ProtonVPN via their ProtonMail credentials. Once a user has signed up for ProtonVPN, all he/she has to do is sign in to his/her account. Then download the official software application. The ProtonVPN Windows client is professional. The main screen shows users a funky map. On the functional side though, it also shows a list of all available VPN servers. The software application also shows the load percentage of each VPN server. This statistic can come in real handy when the user is trying to pick a fast server quickly. Users have the option of using the Quick Connect button. This button will allow the software application to select the fastest VPN server for the user. Users can also click on a country. Such an action will allow the software application to auto-select a VPN server at that particular location. 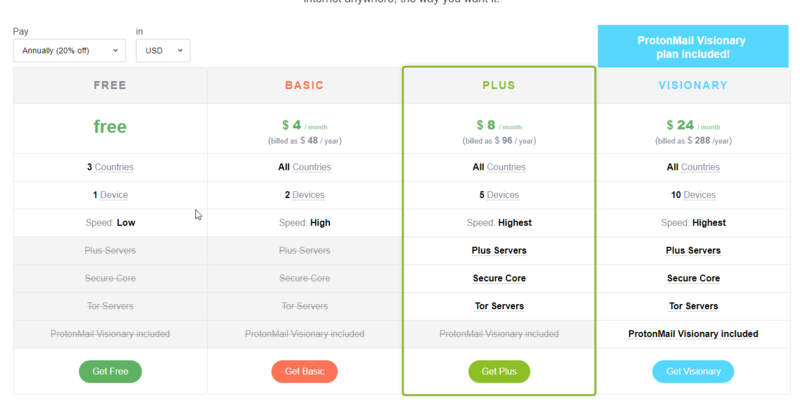 ProtonVPN has clearly labeled its servers into different categories. Some servers support Secure Core and some don’t. Similarly, some support Tor and others don’t. ProtonVPN has also marked servers available for different subscription plans. Whenever a user connects to a server, the application shows a nice graph which in turn displays the user’s connection speed along with bandwidth usage. ProtonVPN Windows client does protect the user against DNS leaks. The application also has a kill switch. Well, think of it as a switch that disconnects you from the network if your VPN connection drops. ProtonVPN has a firewall-based Kill switch. You don’t need to go into the details of what that means. Just know that ProtonVPN has the best kind of kill switch. Because it takes away your PC’s ability to connect to the wider internet if it detects a VPN connection drop. ProtonVPN also has options for users who want to connect to OpenVPN via TCP and UDP protocols. There are no options for port selection though. From an overall perspective, ProtonVPN Windows client is smart. It offers all the standard and advanced (important) features that you would want from a VPN client. If a VPN service provider has all the features in the world but doesn’t have speed, then it is basically useless. You can test the speed of your VPN service provider in many ways. One way is to use testing services such as speedof.me and speedtest.net. All you have to do is measure your internet speed from these sites multiple times without your VPN service provider. And then with your VPN service provider. Then mix up the servers to get better results. Then average all the results out. We know that it sounds simpler than it really is. But the point is, most VPN service providers eat up your download speed. Good VPN service providers don’t decrease your download speed as much as bad VPN service providers. You also have to watch out for latency rates. Moreover, you have to test a VPN service provider on its US servers and UK servers along with any other server location you like. 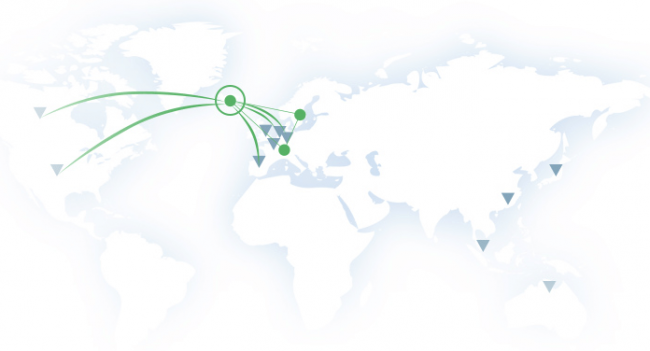 Most VPN service providers have the fastest speeds on their US and UK servers. Well, our research for this ProtonVPN review shows that ProtonVPN offers superb speed. Expect slower speeds when connecting to far away VPN servers though. But the interesting thing our research dug up is that ProtonVPN doesn’t drop your internet speed that much even when you are using the double-hop feature. The feature ProtonVPN calls Secure Core. And since ProtonVPN doesn’t drop that much speed even with Secure Core, there is no reason to not use Secure Core. Our research also shows that you can expect good speeds even on the Free plan. ProtonVPN itself advertises the Free plan as having slow speed. But we didn’t get that feeling. Because it blows away even some paid VPN service providers in terms of speed. As mentioned before, the Windows client will protect you against DNS leaks. And that’s what our research showed as well. Don’t expect any IP leaks on OpenVPN GUI either. The official ProtonVPN FAQ says that it does. Our research tells us something else though. This is where ProtonVPN loses some points. As of writing this ProtonVPN review, the company only offered a custom client for Windows. For other platforms, you will have to use manual setup guides. DD-WRT routers, even custom ones, via OpenVPN files. In other words, any platform that supports OpenVPN VPN client can use OpenVPN config files that ProtonVPN provides on the official website. As mentioned in the beginning as well, the arrival of ProtonMail put a lot of pressure on ProtonVPN. Everyone wanted to believe that ProtonVPN represented a great VPN service provider. And we are happy to say that ProtonVPN didn’t disappoint. ProtonVPN is not only polished, it is also very functional. 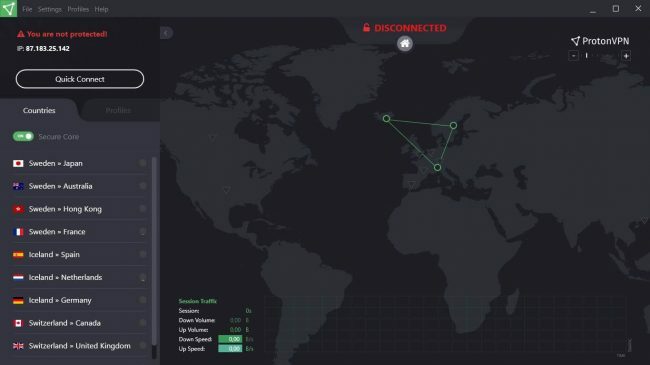 ProtonVPN provides a high level of security. And most of all, it has high speeds on its good VPN servers. Moreover, it has some cool advanced features. Advanced features such as Secure Core. It is certainly not as innovative as the company would want everybody to believe, but it still executes solidly. We can overstate how impressive it is that ProtonVPN Secure Core network doesn’t drop much internet speed even though it is going through another VPN server. ProtonVPN doesn’t offer any type of obfuscation features to get rid of VPN blocks. But then again, ProtonVPN is new. It doesn’t have the experience yet. But it has a great team behind it. The same team that gave us ProtonMail. Hence, we think ProtonVPN will continue to move upwards in the coming future. Expect more advanced features to come out very soon. In short, ProtonVPN is a highly competitive and excellent premium VPN service provider. Perhaps it is even more. Because it offers a great Free plan as well. The only drawback of the free plan is that you can only use three VPN server locations. But the free plan doesn’t have any data limits. And offers better speeds than many paid VPN service providers. ProtonVPN free plan is truly an exception though. Because the general rule is that all free VPN service providers are as close to rubbish as anything can get. With the ProtonMail team backing ProtonVPN, everyone expected great things from ProtonVPN. And ProtonVPN delivered. 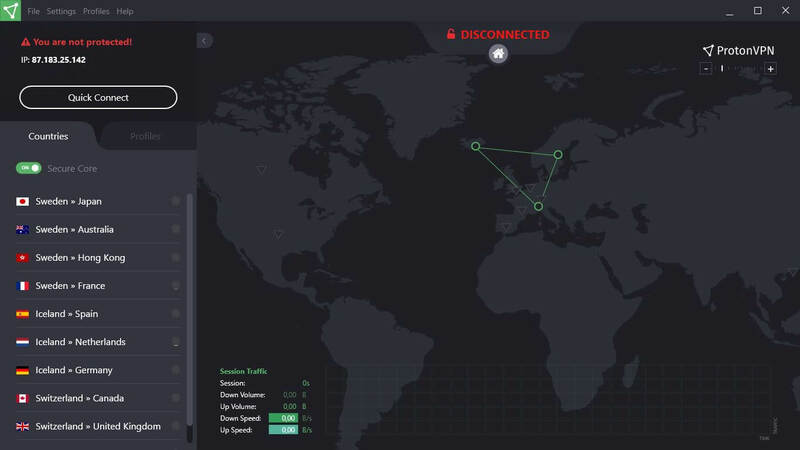 ProtonVPN is one of the more polished VPN service providers. The company does not keep logs and provides excellent speeds on nearby VPN servers. Moreover, it has excellent security. Seems like we have something in common. Josh: yes, one step at a time…. Yes. Going at something step-by-step is generally the most efficient way forward. How to find capable installation assistance for reasonable cost? You don’t need any assistance. Certainly not an assistance for which you have to pay. All you have to do is buy the subscription package and download the relevant installation file from the official website. Accessing Netflix US works for me though. Hope you are not facing any streaming issues. order to create an account. Geez Proton, do you want my address also, so the swat team can swoop in because I’ve downloaded a picture of a girl who will turn 18 tomorrow? (sarcasm) Get real. Thanks for the comment Normal. It is unfortunate that you had to experience this. Despite all the information it requires, ProtonVPN has watertight privacy and security. As far as free VPN services go, there is none better than ProtonVPN. 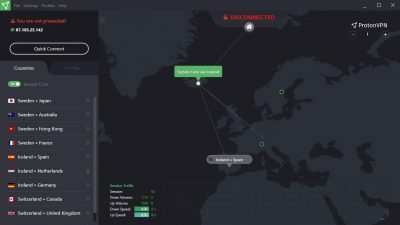 ProtonVPN is purer garbage and this is an awful article. How is it pure garbage?